Bklt:Nuestra Senora da al Mundo el Rosario de los No Nacidos ("The Rosary of the Unborn”/Spanish). 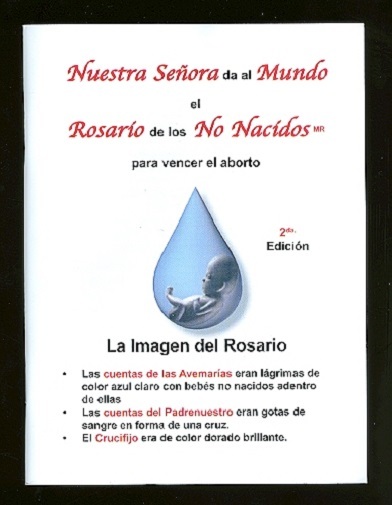 Booklet: Nuestra Senora da al Mundo el Rosario de los No Nacidos. (SPANISH version of Our Lady Gives the World the Rosary of the Unborn to Conquer Abortion). Explains the origin of the Rosary of the Unborn, given to the world by the Blessed Virgin Mary to bring an end to abortion. Messages include those concerning the Rosary of the Unborn, abortion, prayer, and a message regarding the terrorist attacks on the World Trade Center on 9/11/2001 and its relation to the views of the United States on legalized abortion. Contains a section on how to say the rosary and pro-life meditations. Softcover, 4-color cover, 48 pages.